Warning: The following comment may offend some readers. I thought Terre á Terre was...ok. I say that because this restaurant has an almost religious sect following and I can imagine the hordes of people with flaming torches waiting for me outside. It's one of Brighton's leading restaurants and locals really do have an affection for the place. 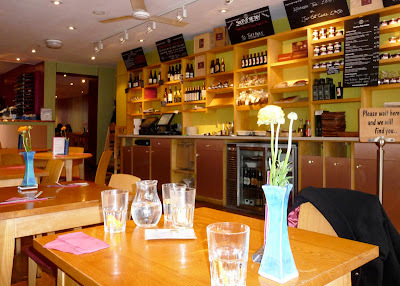 The Observer Food Awards voted it best for vegetarian food in the UK... yadda, yadda, yadda. First off, the gigantic menu was a bit crazy. There was not loads on it, which is good, but the thing was massive. This must be the place for visually impaired vegetarians, because you could read it from across the street. And you don't want to sit down with your companion only for any conversation to be immediately obliterated by a huge sheet of card. Nuts. Anyway, what was on it sounded fantastic and was seductively written so the only possible choice would be some starters and the Terre á Tapas, a selection of items from the whole menu because I couldn't pick. I had soup which was... ok. Roasted pepper served with fresh focaccia. The good - I liked the flaked almonds on top and the focaccia was fabulous. 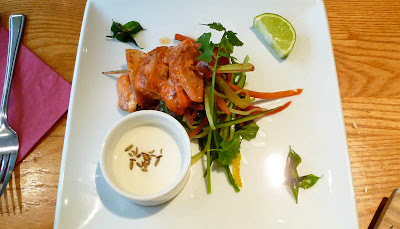 The Tikka Kachumber starter–a tikka halloumi kebab–failed to pack a flavor punch. It was balanced, it was tasty but the lack of spice depth made it feel something was missing. Boring. 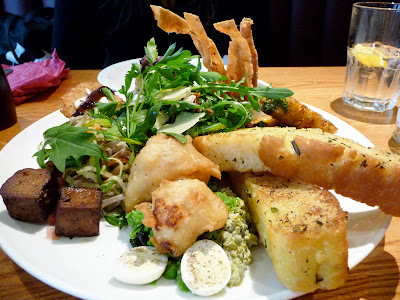 The impressive looking Terre á Tapas came along and cheered me up a bit. It was essentially bits and pieces from the menu - an assortment of salads, pulses, baba ganoush dip, deep fried corn cakes, noodles and battered hallumi. It also included the most intensely flavoured tofu I had ever eaten. I usually can't stand the stuff as it's bland, but now I know I don't like it with flavour either. Most of it was lovely, good quality ingredients and well prepared but not sure how I feel about the £19 price tag (for two) and the fact it felt like all the items had the same base ingredients. I like the concept. Vegetarian food with out the hippy yogurt weaving connotations - a safe environment for us meat eaters on a night off. Smart, professional and well presented food. So what's my problem? Maybe it was because it was lunchtime and dinner may have a bit more va va voom, I don't know. It wasn't Terre á Terrible but it wasn't terrific either and really do not get the hype. How can I sum it up? I would say I had a really good mediocre meal. Anyone agree / disagree? Someone change my mind so I go back for dinner. Until then I'm off to the steak house.